« 8. What Is The Difference Between Sin, Sinful Nature & Sinful Flesh? So when does life actually begin? This is important because there is a starting point in man’s life when he becomes accountable for his sins. Both of these issues (when life begins and when our accountability of sin begins) require a correct understanding of life. Correct understanding stems from sound doctrine (sound doctrine is both harmonious and biblical). Is a man (human) actually considered living if it has not yet been birthed? We could argue that the start of life begins with the human fetus, during its development within the womb of a woman, which is what many modern-day groups advocate. And yes this position does have great merit, but does holding that position apply if we are following the Bible’s presentation as to when a man is considered to be a “living soul“? Specifically does having “life” as a “living soul” begin with the “unborn” (the developing form of life – the embryo) or when the newborn infant has been “birthed” into the world. Putting aside modern-day medical arguments as to when life actually begins (i.e., the egg, the sperm, independently, jointly combined in the womb, out of the womb, or is it after “birth”), the biblical definition as to when God considered man to be “a living soul” was after man took his first breath of life. In addition, the words “birth“, “born” or “begotten” all indicate the “beginning” of life. Since the bible is my guided source of reference on this subject matter, Genesis 2:7 will be the foundation of life within this website. 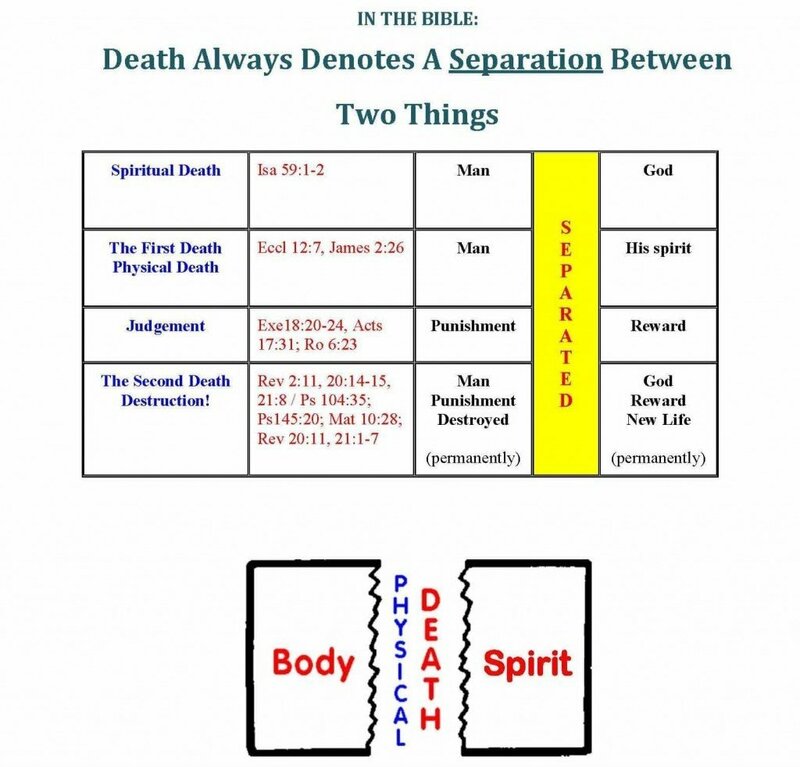 There are two types of death reflected in the Bible; a physical death (where the flesh and all of its bodily components ceases to function) and a spiritual death (or a separation from God). Satan, his angels, many sinners and non-believers experience this type of dead relationship. (1 Corinthians 15:21) is usually argued in conjunction with (Romans 6:23) which states the wages of sin is death and until sin entered the world through Adam, death was not part of the human equation. This, however, is actually contrary to the reading of (Genesis 3:22) and (Hebrews 9:27). 2) there was also a special tree that provided Adam with the opportunity to live forever, a tree called “the tree of life” (Genesis 3:22). Adam and Eve had an opportunity to escape physical death (and take also of the tree of life, eat from it, and live forever: (Genesis 3:22) it is however very clear that outside of man eating from this one particular tree, God had purposed man to be capable of dying “physically,” regardless if Adam committed sin or not, otherwise there would be no need for such a tree, a tree that provided this feature (life forever) if their bodies had this quality or attribute (eternal life) already built into their physical make-up or essence. Had Adam chose not to eat the forbidden fruit we would then have the situation where no sin would have been committed but yet death could still occur. This will be important later because the promise was in that day he ate he would surely die (Genesis 2:17); that certainly did not happen within the confines of a day (our 24 hr time frame cycle from when the sun rises until when the sun sets) and according to scriptures it took many days (many sunrises and sunsets) before physical death befell Adam, because Adam lived to be 936 years old (Genesis 5:5). 2. Since Adam had eaten of “the tree of the knowledge of good and evil” he for sure was going to die, and did. There are actually two life-altering conditions that took place and both must be noted here. a. From this point forward physical death became genetically “locked in”. Because Adam and Eve both ate of the forbidden fruit, the nature of physical death was passed thus passed down to all mankind. 3. But what if Adam would have eaten of the Tree of Life first and later from the forbidden tree, thus obtaining both “life” and the additional knowledge of good and evil? Conceivably both could have lived forever physically. Yet in order for God’s word to be true both should face death, in some manner (Again the “spiritual death” experience still exist). However, I personally do not believe that this particular scenario would have been allowed to get to this stage. From all indications it appears that God would just as easily prevented the other tree from being accessible as he did when Adam disobeyed God the first time; God removed the remaining Tree of Life option after Adam made the choice to eat of the forbidden fruit tree. It is not disputed that God punished Adam for his disobedience (disobeying God’s commandment). Adam’s punishment also affected mankind. The argument however usually lies in determining what the punishment was. Adam and Eve’s punishment is actually listed in detail in Genesis 3:16-19 primarily labor in birth and hard work. No one disputes that it still fits that description today. This is possibly the BIGGEST misconception made interpreting the Bible. Either God allowed Adam to die for being disobedient, just as God said would occur OR Adam died as a direct result of what was eaten. For a moment let’s just review what we know for sure. The information God provided Adam was a warning that he would die the same day he ate of the forbidden tree. It’s like me telling you if you eat this White Baneberry (a poisonous berry) you will die as a RESULT most of us would avoid eating of this plant. But God did not indicate that this tree was somehow poisonous and could not be eaten as food. Clearly, they could eat of this plant (tree). So was the tree something that was bad for food? That is not indicated. God WARNED Adam that if you eat of this one specific tree it will cause his death. The tree did exactly what it was there to do and the results also took place as God said would occur. This is important because neither the tree nor it’s fruit, killed Adam. We can’t blame the tree for doing what it was created to do, “to know of Good and Evil.” We have just proven that Adam did not die physically the same day he ate of this tree, so what actually happened? Note: Again, it’s important to remember that Adam and Eve did not possess “Eternal Life” traits prior to eating of the forbidden tree, thus they were “ephemeral” created beings in nature. They were, at some point, going to die unless they obtained this eternal life “opportunity” eating from the Tree God put there for that purpose. Note: Both Trees provided them with opportunities to obtain abilities they originally lacked!! The tree, in essence, can be said to have altered man’s genetic makeup providing him with this new ability. Man, being a descendant of Adam has inherited the same ability “to know of Good and Evil“ as did Adam and this is a common trait in a man. This is supported by the fact that the bible does not indicate that this ability (to know of Good and Evil) was something Adam had prior to eating of this tree. It is evident that both Adam and Eve were able to converse with God (a Spirit being) Genesis 2:9, 13. God has given all men this ability but only as determined by God. Some God chooses to converse with and some God chooses not to converse with. You may have to continue reading the Word of God, seeking his presence. God converses with those he chooses, directly or indirectly, through angels, dreams, visions, etc. The bible is full of prophets, Holy Men and others reflecting these occurrences taking place. Likewise, Jesus was also born with this same genetic make-up (or human ability), as you and I, “to know of Good and Evil”, however Jesus was not born disconnected from God (as most men) Jesus was born with the Holy Ghost (Matthew 1:20, Acts 10:38). How does someone die Spiritually? This is important because Paul, and various other New Testament writers, talk about death in reference to Adam and Jesus in this same metaphoric sense. When one is spiritually dead (separated from God) a spiritual rebirth is needed. This rebirth can be viewed as a redeemed position which allows each individual to be forgiven of any sins committed and reunited to having an “actively living” or “functioning” relationship with God our Father (a rebirth) one where we can often feel his presence directly. The wages of sin is death: Spiritual death, not Physical death. Note 1: Regardless what sins you may have committed, every human is capable of dying physically (as was Christ). Death in this passage is in reference to a spiritual separation (a dead or detached relationship) between God and Man. Also, consider those individuals who lived and actually committed no sin at all? For example, take the lives of every newborn infant (or if you consider the embryo as the beginning of a new life apply the same scenario) who faced early deaths (a fatal accident, disease, cancer, etc…) but had not committed any sin as yet. These infants did not die (physically) because they had sin in their life (See why: Should Babies Be Baptized? & Jesus The Human Infant). They are certainly not going to Hell, nor are they going to burn forever in the Lake of Fire. Of course, God had all special circumstances covered from the beginning; it’s called Judgment Day (Romans 14:12). Normally, however, you can not receive this “gift” of Eternal Life unless you first establish a spiritual relationship with God, which is through Christ. Note 2: This passage of Romans is similar in nature to the promise God made above in (Genesis 2:17); in the day Adam ate he would surely die. His death was spiritual; a separation (between God [a spirit being] and Adam) took place. God still had relationships with other Biblical figures (Moses, Abraham, Job, Jesus, etc..). (John 11:26) “And whosoever liveth and believeth in me shall never die. This passage of scripture is clearly another metaphor, as all men die (Hebrews 9:27). Every time Paul mentions “death” in Romans, he is referring to spiritual death. This is further supported by numerous other scriptures. Note: The quickening aspect is indicated as being obtained now not after we are physically dead. We (the Saints) have been forgiven before we die thus we are ready for death (physically) as we have been quickened and await to be changed, “In a moment in the twinkling of an eye” to meet Christ in the air when he comes (1 Corinthians 15:52).